Greetings all summer gardeners ! The Tampa Bay Times had a great article today about backyard gardening and lots of great edibles that can be grown for the summer. We know many of you are getting more and more into growing edible fruits and veggies to supplement your grocery buying especially as grocery costs continue to spiral up ! Rosemary was one of the plants featured in the article and we could not agree more, it's one of our favorites. We grow Rosemary for 2 purposes - one, of course, is it's great use in cooking, making teas, infused oils etc. The second is that it's a great landscape plant being heat and cold hardy. 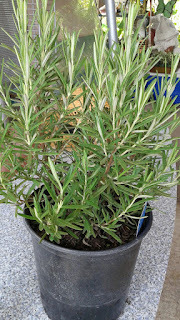 Rosemary loves sun and good moisture and is very EZ to care for once it is established, with regular fertilization. You can take tip cuttings or use the whole branch when using it in your cooking. Stripping the leaves off the stem, it is best to cut it up finely when adding it, as is, in cooking (try it on fried potatoes - see recipe below). If you want to use it to infuse in tea or oils, you can place the whole (or part) of the branch into the liquid. 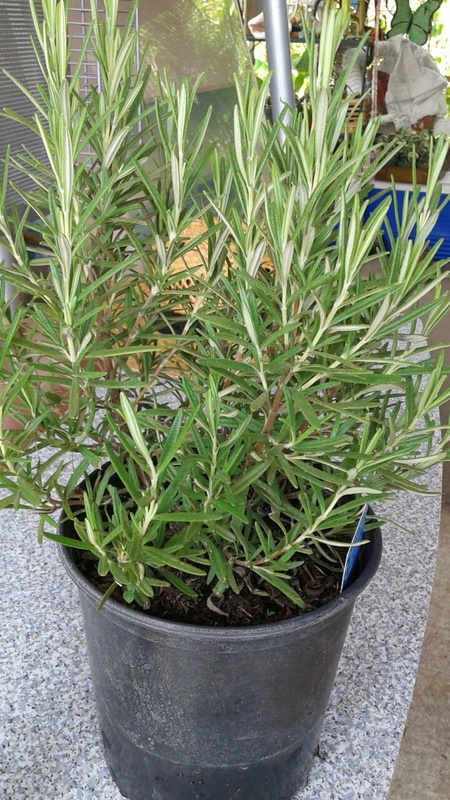 We primary grow Rosemary in 1 gallon containers and have them weekly at market. Recipe: Rosemary potatoes: prepare Rosemary by chopping up leaves finely. Dice potatoes and onions (whatever size/type your preference). Add 2 tablespoon Olive oil to pan and heat up. Add potatoes and onions to the pan and fry on medium for about 10 minutes. Then add your rosemary and cook another 2 minutes. You can also do this recipe as a baked dish. Use the same method of baking the onions and potatoes for about 15 minutes, then sprinkle chopped rosemary over top and bake another 5 minutes. It taste great and makes your house smell herby yummy ! Lemon Grass, another featured plant is a great, easy addition to any garden and you can grow it in-ground or in pots. Loving sun, heat and good moisture, it loves well drained soil, and grows as a clump. With natural pest-resistant properties, it is also welcomed in the garden for its aroma. In Asia, field workers regular rub lemon grass on their bodies to help keep skeeters away ! It can be very versatile in the kitchen and there is ton of great info online for recipes and instructions. We have them in 1 gallon containers at market. Peppers are also a easy thing to grow in the summer. They love our heat and the sun. While they can be grown in-ground, we have found for ourselves, that growing them in pots is easier but you have to provide them some support, such as trellis or bamboo rods, as their stems can get heavy. We grow a variety of Hot peppers from jalapeno to habanero to scotch bonnets and are always looking for new hybrids to grow. Typically you can pick peppers at any stage, but as they turn redder (or orange, or even purple! ), the hotter they get. A little bit goes a long way with peppers. The important thing is to pick and use your peppers on a regular basis so that the plant will keep producing. We always have some type of pepper each week at market, in 1 gallon and 3 gallon containers. Passion Fruit Vine continue to be a crowd favorite. The Purple Possem Passion Vine we grow its easy to care for once it is established and one plant can produce hundreds of fruits. At present, we are sold out of mature plants and are awaiting the next crop to mature, hopefully in the next couple of weeks. We had a great turnout out at the opening day of Summer Saturday Morning Market last weekend at Williams Park and vendors and customers alike loved the shade and coolness of the glorious Oak Trees in the park that kept us all comfortable! While summer market is smaller, you can still find a great variety of vendors there with lots of great produce, cheeses and breads, ready to eat food, arts and crafts and music and lots of places to sit in the shade and enjoy market. We love easy to care for plants and everyone always loves a great plant that can decorate their house, porches and offices. 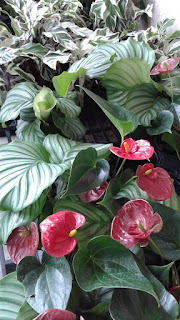 The Red Anthurium at right, is a dwarf hybrid all the way from Holland. 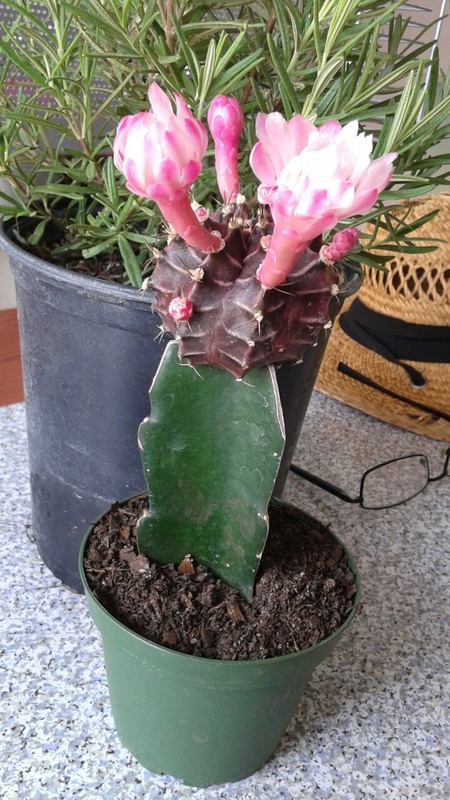 Growing only to about 12 inches high, it produces multiple long lasting flowers. The middle foliage is the Calathea orbifolia, aka as the Watermelon Leaf plant. The large leaves have wonderful texture and the pattern looks like a Watermelon. In the back, is the new Calathea Fusion White - gorgeous variegation and a slight tint of lavender color on the backs of the leaves. 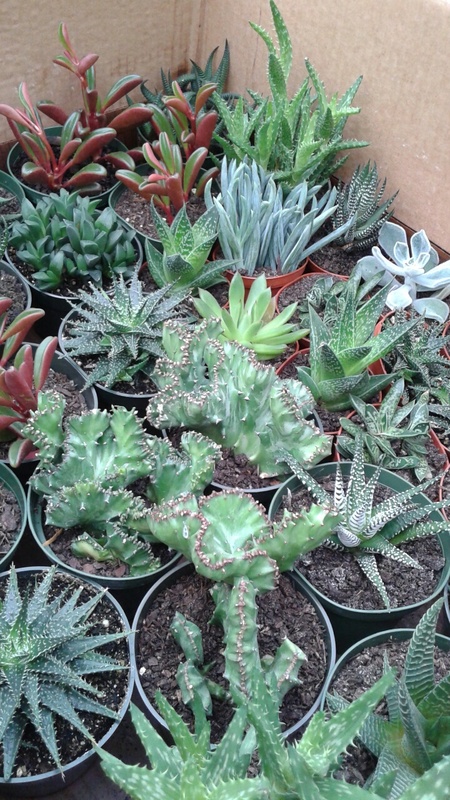 Succulents, succulents everywhere ! EZ to grow, just need watering every 2 to 3 weeks. We can a wide variety of them and the types we offer are the ones we have found to do the best over a long period. 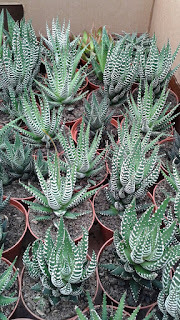 Mix and match or keep separate, you can leave them, as is, in pots, or mix together in a larger container. These like bright, indirect light.....sunny windowsills, porches and lanais, sun rooms etc are all perfect spots for them. The "Haworthia" Succulents are one of our most popular. With great variegation, texture and growth pattern, they really interesting to watch grow. They will produce babies around their base. Being a bit taller than some of our other succulents, they make a great "middle" specimen to surround with other succulents. Although they look "spiny", they are not, and are safe to touch. 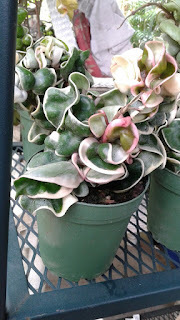 Hoyas are one of the most prized groups of plants that are collected by gradening enthusiasts and here we have the lovely variegated Rope Hoya. 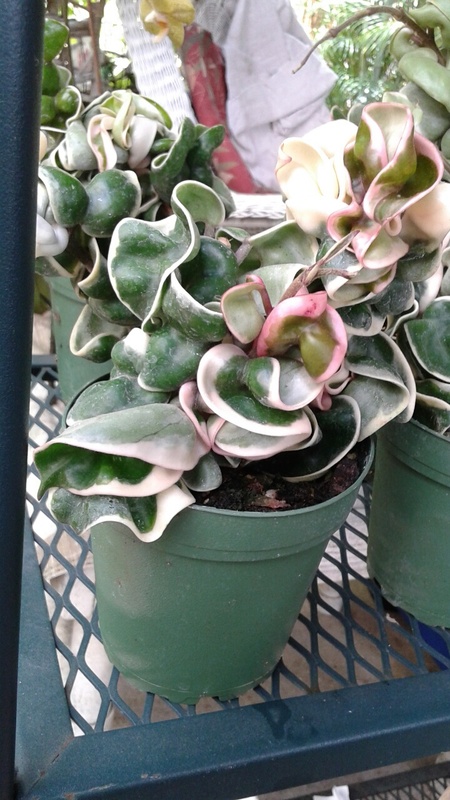 Named because of its unusual twisting foliage, it is mainly green and white with tinges of pink on some of the petals. With maturity, the plant will produce an aromatic bloom. Rope hoyas have been treasured for years and they last years too! We have heard many of story of plants being passed down in generations. We just love these blooming Color Top Cactuses ! Larger than the normal variety you see, they are all beginning to bloom and it's a joy to watch as they slowly unfold their delicate flowers. Again, easy to care for and will provide great color for long periods. Our Butterfly wing (Christia obcordata) flew out of our booth at market this past weekend and this weekend at market, we are releasing another dozen plants from our crop ! Here is how to find us !